Cleaning Your Vinyl Siding - JA Edwards of America, Inc.
Vinyl siding looks great when it’s new and clean, but even the best circumstances will often lead to grimy or discolored areas. Maintaining your home’s vinyl siding is surprisingly simple: you can start with just a little bit of water. Follow these tips for keeping your siding looking like new. Start with a close inspection of your home’s vinyl siding. Look for any mold, mildew, dirt, or discoloration. This inspection will be particularly important after any kind of intense weather event, especially one with high winds or hail. While you’re looking for the spots that need cleaning, you can also identify any damage to the siding. If you see any areas that you think might need repair or replacement, contact us at JA Edwards of America. We can help you with an accurate examination of the siding and can work with insurance companies to solve the problem. Once you’ve identified the areas that need cleaning, start with the easiest method for cleaning siding: water. Often you won’t need anything more than a garden hose and a good nozzle to wash away the dirt. Set the nozzle to a medium spray, strong enough to have some force behind it, but gentle enough to avoid damage to the siding. Start at the bottom and work side to side up the wall. Once you’ve gotten to the top, set the spray to a more gentle pattern and rinse the wall from the top to the bottom. If the hose and nozzle doesn’t quite do the trick, consider a pressure washer. Follow the same basic method as with the hose: choose a setting that is strong but will not damage the siding. The spray will obviously be more intense, but you don’t want the blast of water to peel the siding from the house! As with the hose, start cleaning your siding at the bottom, then rinse from the top. If water alone fails to get rid of the grime, you might want to use a cleaning solution to eliminate the stubborn dirt and mildew. Although many products are available on the market, you can probably make your own. Always remember to cover your plants if you’re using a cleaning solution! Bleach or vinegar can kill a shrub as easily as it can mildew. Also remember to wear rubber gloves when using either of these solutions. Mix 1 quart of laundry bleach with one gallon of water. Add about ½ cup of powdered laundry detergent and ½ cup powdered household cleaner. Stir to mix well. 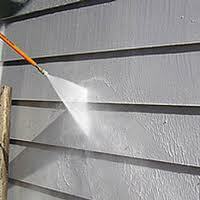 Using a stiff-bristled brush, apply the solution to the siding, scrubbing with the “grain” of the siding. Start at the top of the wall, allowing the excess mixture to run down, making the next slat even easier. Once you have covered the siding with the bleach solution, allow it to stand for about 10 minutes. Rinse, starting at the top of the wall. Mix 1 part vinegar with 2 ½ parts water. The mixture doesn’t need to be precise. An easy way to mix the solution is to pour a gallon jug of vinegar into a five-gallon bucket, then fill the bucket about ¾ full with water. Follow the same method as with the bleach solution. Regular inspection and cleaning of your vinyl siding will keep it looking like new for years to come.